For those who just want the pics, there they are. The rest of the post is explanation on how I went from primed to finished model. First, we laid out the color scheme... while this may not be "traditional" Dark Eldar colors, it matches my Client's army and that was the most important part when it all came down to it in the end. It's no good if I paint a great model, but it doesn't match his army. With the major colors picked out, we came to the freehand on the back of the cape. My Client sent me an image he wanted and I did my best to reproduce that on the entire back of the model. It came out much better than I anticipated it would. I was quite pleased with the end result and was worried that I would lose the blending and shading on the cape to all the detail in the image. It was a bit of a challenge to combine the two aspects and still make it believable. 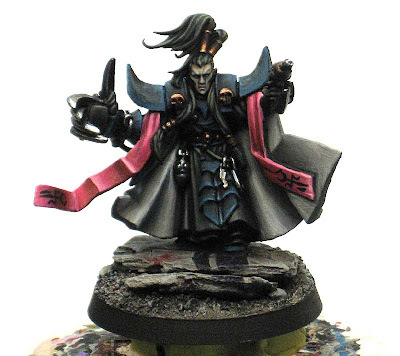 We toyed with adding freehand to the front inside of the cloak but left it off in the end as I could not come up with anything that wasn't more "Imperial looking" than anything else. I didn't want to detract from the model by adding the wrong design just because I wanted to have something there. In the end, I think leaving the front inside blank was best as it keeps it clean looking. The base was designed to look like a partially destroyed Slaanesh temple (note the symbol on the base) that these guys had just rampaged. The blood is a nice touch my Client came up with and I think it's a bit of character to the model overall. It's my first time adding "blood" splatters, so I was careful to not overdo it. It had to look gruesome, but not be over the top silly looking. The base is painted light grey and then a series of thinned down washes of different colors with some thin lines give it the marble look. The metal areas on the model started out being done with NNM. That was quickly scratched in favor of a more traditional approach that could be modified by adding washes to create more contrast. 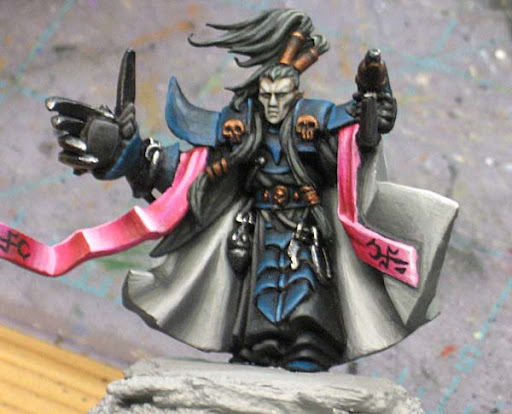 The trouble with using NMM on this guy was it looked to much like his cape in the end (due to the colors and blending) and it was more confusing than it was helpful. NMM might be cool, but it's not always the best technique to use. And these pictures might give you a better idea of the contrast on the model, he's not as dark as the top pictures make him out to be. That is absolutely fantastic Ron - top top job! I would be interested to hear what comments the judges made (I believe you said you had a chat with one?). 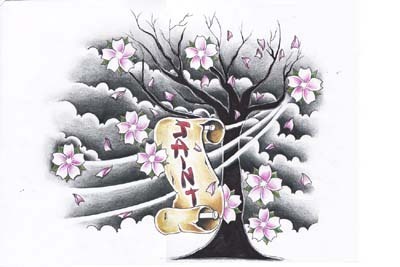 Either way, your client should be a very happy person indeed - the freehand is fantastic! Super work. And the freehand is incredible. If only I had more thumbs, but alas, I can only give you two thumbs up. Simply incredible freehand! Looks awesome! I am insanely jealous of that model. I was wondering where the inspiration for the free hand cape art had come from, its hard to transfer art to that small of an area, and pull it off. wow, the finished model looks great! 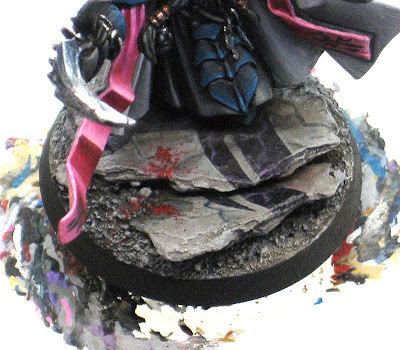 I like the free-hand and the blue-black armor looks great in contrast to the pink-red. Whoah! Impressive freehand as well as nice desing for it. A great mini, and love the colours too. As a Dark Eldar player this captures the look very well. I love the magenta sash on there. Do you have any pics of the army in general? That is an incredible paintjob. Well done! The freehand indeed is impressive. Man, what an awesome job Ron. Sick, sick, sick...that's all I can say! @SC John: This was one of the hardest pieces of artwork to find. I knew I wanted sakura's and after hours of searching I found the perfect image. I unfortunately didn't save a bookmark. It was concept art from a tattoo artist. 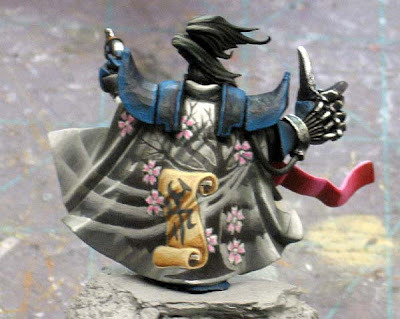 Please let me congratulate you, the model alone is a great example of craftsmanship, but seeing it painted is jaw dropping the cape details are superb. I didn't get to see the freehand on the back @ Gamesday... WOW! Really captures the Dark Eldar mystique: Beautiful and sinister. I saw this at GamesDay, very prominently displayed at the front of the display case. I even stopped to take pictures of it, but wasn't able to capture the whole back of it. The pics don't do it justice. Truly stunning work. Thanks everyone. It's nice to know the work is appreciated. Lloyd: I did chat with a judge when I picked the model up. I knew what was going to get me in the end and I was correct. The freehand needed to be tightened up a bit more and I had to really blend the armour better. SC John: Would you believe I just kinda started painting it and it all fell into place. I didn't do any kind of transfer or outline, I just looked at the picture and made it fit on the cape. Luke: blang86 has got a link to it in his comment. He can speak with some authority... it's his model now. Wow! That model is an exceptional piece of work. All the sculpting and painting really shines. 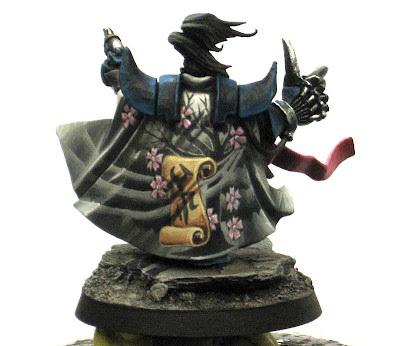 I'm simply blown away by this model; here's hoping GW comes up with something even half as cool on their redesigns.